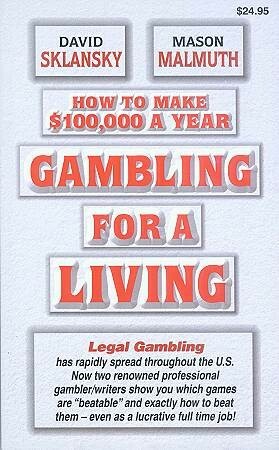 Gambling for a Living by David Sklansky and Mason Malmuth. Is there really such a thing as a professional gambler? The answer is an unequivocal yes! The authors of this book are but two examples. The truth is that there are many thousands of people around the country who make a good living exclusively from gambling. It is not easy, but it can be done. The key idea is to understand which games are beatable and how to beat them. David Sklansky and Mason Malmuth have both spent many years writing about the finer points of poker, blackjack, and other beatable games. (As you will see in the book those other games are horses, sports, progressive slots and video poker, casino tournaments, and special promotions. They don't include craps, roulette, keno, or baccarat for reasons explained therein.) This book, however, was written for the not quite as experienced aspiring gambler. It shows you everything you need to learn and do if you want to gamble for a living both from the practical and the technical standpoint. The rest is up to you.